Network Recovery is the first book to provide detailed information on protecting and restoring communication networks, and it sets a sky-high standard for any that may follow. Inside, you’ll learn specific techniques that work at each layer of the networking hierarchy—including optical, SONET-SDH, IP, and MPLS—as well as multi-layer escalation strategies that offer the highest level of protection. 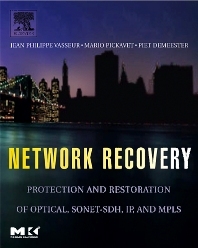 The authors begin with an incisive introduction to the issues that define the field of network protection and restoration, and as the book progresses they explain everything you need to know about the relevant protocols, providing theoretical analyses wherever appropriate. If you work for a network-dependent organization, large or small, you’ll want to keep Network Recovery within reach at all times. Shows you how to implement protection and recovery techniques that will save your organization time and money. Documents techniques for the optical, SONET-SDH, IP, and MPLS layers, as well as multi-layer escalation strategies. Shows you how to evaluate these techniques in relation to one another, so you can develop an optimal network recovery design. Provides industry examples and simulation results. Delves into the inner workings of relevant protocols and offers theoretical analyses wherever this information contributes to your practical knowledge. Networking professionals in medium to large corporations (including gov't. and military) as well as telecom companies, i.e., network engineers and consultants, network managers, systems engineers, protocol designers, network architects and designers, service providers and equipment vendors. Jean-Philippe Vasseur is a Distinguished Engineer at Cisco Systems. He is the co-chair of the ROLL working group in the IETF and the chair of technology advisory board in the IP for Smart Objects (IPSO) Alliance. JP Vasseur has co-authored a number of RFCs on IP routing, MPLS, Traffic Engineering and Smart Object networks.